“Music from everywhere. 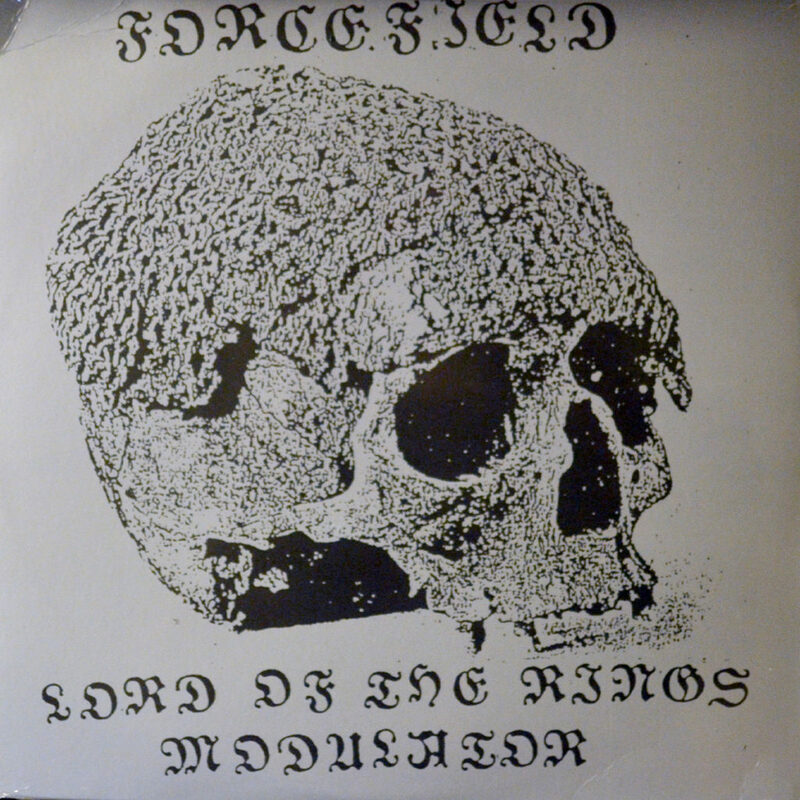 We don’t discriminate.” The record label specializes in folk music from around the world,something I’m always interested in, but it was the eerie stylized human skull on the cover that really drew me into Forcefield new full length. Judge a book by its cover? Maybe a little, but my first mistake was to judge ForceField by their bandcamp tags. “Folk, traditional, dungeon synth.” I know what most of these words mean; folk, traditional… might be corny. Dungeon synth? I know what to expect from synth music, and “traditional folk” plus “synth” music is something I can imagine (albeit with more “corniness” alerts), but it’s that pesky “dungeon” part of the descriptor; what does that mean? From the instant I hit “play” I realised I was in for something far more surreal than I had bargained for. At once, all my descriptors failed me as I was wrenched into another world where nothing I thought I knew mattered and nothing I took in made sense. I struggle to call what Forcefield have done here “music” because it fails to meet so many of the basic criteria I associate with the term. To take in “Lord of the Rings Modulator” is not so much ‘to listen to an album’ as it is ‘to have an experience’; and that experience is a 40 minute trip on mystery Chinese research chemicals when you thought you were doing a hit of acid. Forcefield certainly IS an artist, and their creation definitely IS art, but rather than calling it an album of songs, I feel it more accurate to refer to the installment as a collection of pieces. “Lord of the Rings Modulator” is a gallery of Forcefield’s work, and I went on the full tour. By the end of the first track, I knew I had to see where this artist was taking me and, undaunted by the 30+ entry long tracklist, I committed to sitting in my chair and listening to the whole thing. With every unexpected twist and turn, I was exhilarated by thoughts of where this creation could possibly take me next. Where it DID take me, I’m still struggling to put into words, but it certainly was SOMEWHERE. As jarring and atonal as the experience was, I found the entire collection mesmerizing. The artist seems at times to be actively seeking to take the audience outside of their collective comfort zones. After establishing a pattern of “no pattern” erraticism, the next movement of the collection becomes a grind of repetitive pulsations; as if to say “if you actually enjoyed how frantic and crazy the beginning was, you’ll hate this!” But by this point my mind was made up and I was determined to see the work through to the end. The third movement of the collection is where the artist lost me. The longest piece, D, is a seven minute avant-garde stare into a future so distant I can’t even imagine it. I am out of place and time in the wash of sound which makes the first appearance of discernable words even more “othering”. Once again, Forcefield attempts to derail the listener’s sense of scale and place by following two 6+ minute behemoths with a series of shorter installments, several of them below the 1 minute mark in length. These bits and pieces tease and tempt the listener like fairy spirits deeper into Forcefield’s synth dungeon and onward to the next movement. While undeniably dark at times, it’s hard to classify Forcefield’s work as “dark-” synth or noise; it steps too far and too often outside to bounds of dreariness and gloom associated with those labels. In moments here and there, it even peers into the windows of “goofiness”, although it never actually commits to being so odd as to become comedic. After so many short pieces, the increased run times of U, V, and W are when the collection begins to feel a bit long in the tooth. With X, a heavily distorted vocal sample from the old animated adaptations of Tolkien ushers in the penultimate movement of the collection. The final movement, Alpha, Aleph, Gimmel, and Omega, are something of a postscript to the A-Z collection, but no less weird. None of them would have felt out of place earlier in the body, but coming all after X, Y, and Z, they feel like a definite shift in tone. An experience like “Lord of the Rings Modulator” is one that can open many doors for the listener. For me, it left me in awe at the possibilities I could explore next. “If they can do that,” I reason, “what else can we do?” I can’t say I intend to revisit this art installment anytime soon, but I’m very glad I gave it a chance in the first place. Recommendation – I recommend that you be mindful about what ELSE you’re trying to do while listening to this. It’s too weird for background music and not engaging enough to be the center of attention. It wouldn’t pair well with alcohol or most drugs. Spouses, children, and coworkers are sure to hate it… In fact, it’s difficult to imagine who this piece of art is for. And that makes it kinda special.